I know I run the risk of overplaying this description, but the folks who have put together three compelling concerts next week described under the heading, "The Human Voice in a New World", make music as it might sound had neither language nor musical instruments yet been invented. Actually, these masters (composers, poets, artists, performers, writers and interactive technology engineers) could hardly ignore the existence of sophisticated language or highly-evolved musical instruments; They obviously have been informed by both. It's just that they have found a way of introducing us to musical sound in ways that make it seem we were fundamentally innocent of its pleasures until now. They would also have us see the music, both literally and figuratively. Even without conspicuous visual elements (the most dramatic representation is included in Monday evening's performance of "Messe di Voce"), these programs appear to be something which could be enjoyed by anyone interested in the experimentation, innovation and originality of emerging work in the visual arts - and the reverse seems equally valid. I know I'm not the only one who thrives on an immersion in the output of the freshest, most creative genius which can be found in both these arts, and I have no academic background in either. I'm still hoping to speak with just a little authority on the subject since I've been listening to a number of these sound artists for decades. Most have been around for years and some of them may be as old as I am, but what they will be doing next week would be very new to almost anyone anywhere. For the tiny few who will make it to any of these performances it will look and sound like tomorrow, because almost none of us has been listening to and thinking about today as closely as Joan La Barbara, Jaap Blonk, Golan Levin, Zachery Lieberman, Trevor Wishart, Joel Chadabe, Richard Kostelanetz and David Moss. I'll be there each night; I wouldn't miss one of these concerts for just about any temptation. They are being presented by the Electronic Music Foundation [EMF]. Monday's performance, at NYU's Frederick Lowe Theater, is produced in collaboration with the NYU Interactive Arts Series and is free. On Friday and Saturday, at Judson Church, you'll be asked to pay all of $15 ($10 for students and seniors). A generous amount of information, including sound samples and all the details on the performances, can be found on this page of the Electronic Music Foundation site. 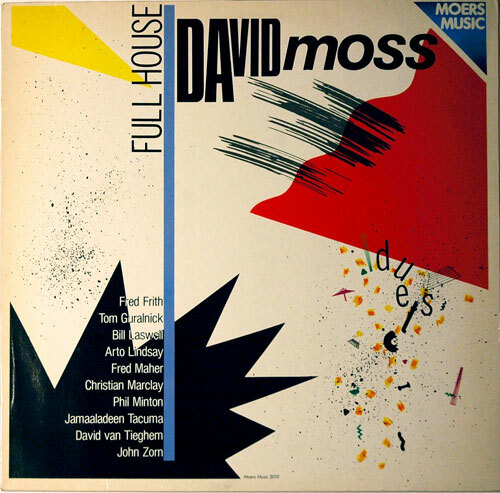 The image I'm including below is a shot of the cover of one of my 25-year-old LPs of David Moss, one of the two featured artists on Saturday evening. Look at the list of his collaborators at the bottom of the cover. ADDENDUM: It's the next morning and I'm feeling weird about not including some kind of image related to Trevor Wishart's concert. He will be collaborating with Joel Chadabe and Richard Kostelanetz on Friday. In the middle of last night I went hunting for Wishart's name and found an image which had been uploaded onto flickr by Sonic Arts Network. 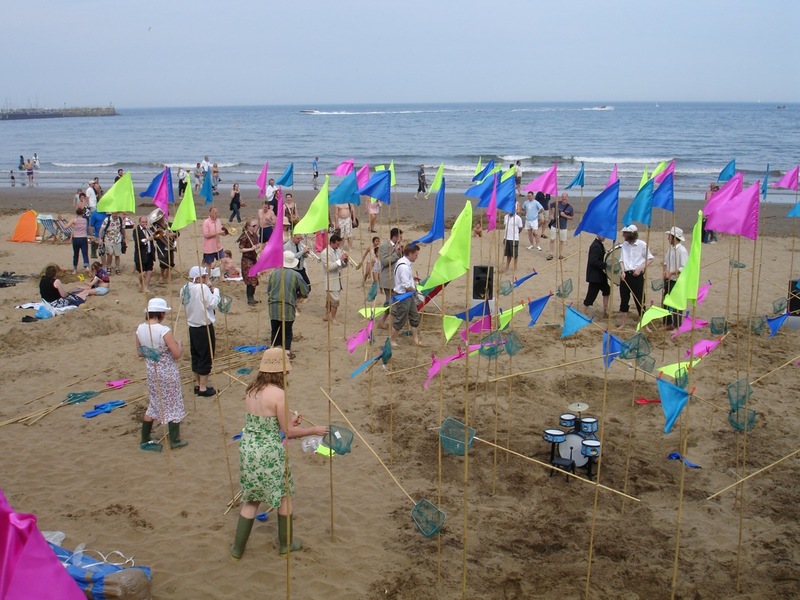 It's of a revival at the group's 2005 Expo festival in Scarborough, on the Isle of WIght, of the British artist and public sound activist's 1977 piece, "Beach Singularity". A video documenting a part of the day-long performance can be seen here. Note: "The Human Voice in a New World" (subtitled: "A series of live performances exploring the crossroads of the human voice and technology") is not a particularly catchy tag. Even after several days going back and forth to look at the program information I still couldn't remember the name of the series I'm so excited about; the programs are bound to be much sexier than the billing might suggest. Published on February 20, 2009 3:49 PM.